Two seemingly incompatible worlds have been joined together thanks to a new technique which allows weaving sensors and semiconductors directly into clothes. 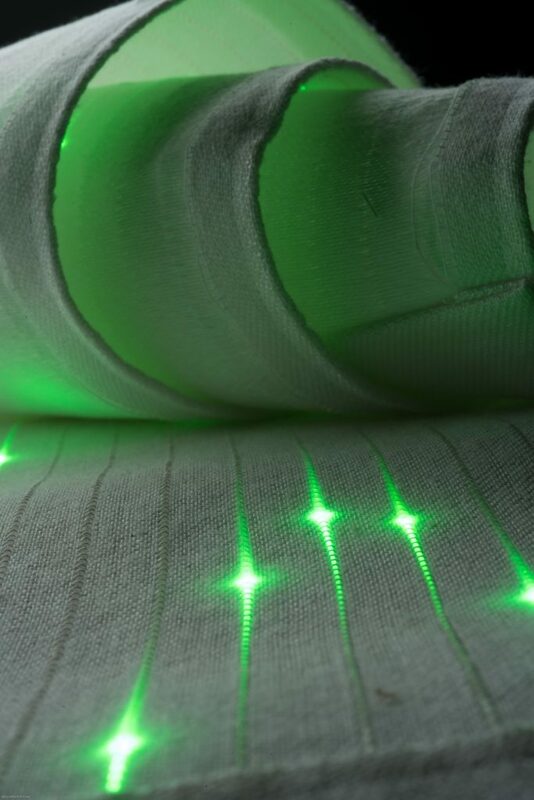 Knitted fabric illuminated by embedded light emitting fiber. Pictures taken by Greg Hren. Owner: Michael Rein and Yoel Fink. Even before humans developed a true society, we were relying on textiles to cover our skin and insulate ourselves from the cold and rain. As technology progressed, we used textiles for a wide variety of purposes, from backpacks to packaging, and, of course, more clothing. Now, textiles might be getting a revamp and might go “smart”. Everyday objects seem to get smarter and smarter by the day. We now have smartphones, smartwatches, even smart homes. But one commodity which has remained stubbornly non-smart are clothes. It’s not like clothes wouldn’t benefit from this — there’s a wide array of potential applications, from health sensors to cool, changing colors — but the fabrication process has remained cumbersome and difficult to effectively apply. Simply put, electrical circuits and textiles don’t normally mix well. This is where Michael Rain, Yoel Fink, and colleagues, enter the stage. They started with a larger polymer mass containing the semiconductor devices alongside a hollow channel. This material is heated and drawn out, at the same time as wire is spooled into the channels. “As the preform is heated and drawn into a fibre, the conducting wires approach the diodes until they make electrical contact, resulting in hundreds of diodes connected in parallel inside a single fibre,” the study authors explain. 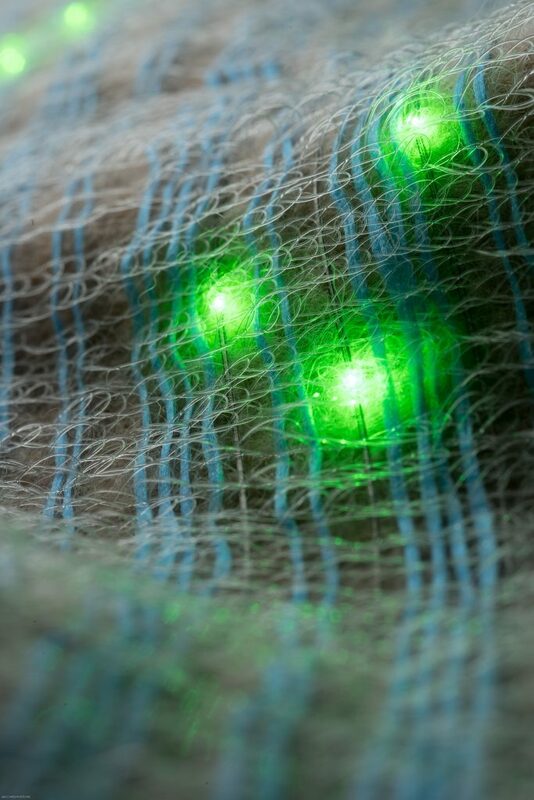 Light emitting fibers woven into fabrics.Pictures taken by Greg Hren. Owner: Michael Rein and Yoel Fink. Diodes (either LEDs or photodetecting diodes) are spaced out and once drawn, the resulting fibers can be easily woven into fabrics. The process is inherently scalable, allowing the creation of hundreds of meters of these smart fibers, thus overcoming one of the main problems associated with this type of process. The manufacturing process also provides a pattern to knit fabrics with even more advanced functions — opening up a whole new area of research for smart textiles of wearable technologies. In an accompanying News & Views article, Walter Margulis, a guest professor at KTH Royal Institute of Technology with 30 years in photonics, explains an application demonstrated by the study authors. Essentially, this paves the way for integrating low-cost electronic components into fabrics. Whether or not this becomes common practice will presumably be controlled by economic rather than scientific factors, Margulis says, but it’s easy to envisage practical applications of this technology. The study “Diode fibres for fabric-based optical communications” has been published in Nature.